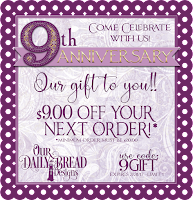 Welcome to Our Daily Bread Designs Special 9th Anniversary Release and Blog Hop! Today members of ODBD Design Team are sharing projects created with the new Special Edition 2017 Anniversary Release! Be sure to keep reading below to see how you can win a $25 ODBD Gift Certificate! ODBD kicked off the 9th Anniversary Celebration with a special gift code. If you missed the post on the ODBD Blog, click here. Today, I'm sharing two cards using the new Anniversary Release products, Large Numbers die set and the Celebration stamp set, along with additional ODBD products. Please see my complete supply list below. The Large Number dies make a wonderful embellishment on your cards and the Celebration stamp set covers many different life celebrations! The stamp set was designed to be used along with the Pennant Flags die set. In my projects below, I used stamps/die or the "th" and the word "again". The 2017 Special Edition Anniversary products are sold separately and also in money saving bundles! The two bundles are the 2017 Anniversary Bundle and the Celebration and Pennant Bundle. 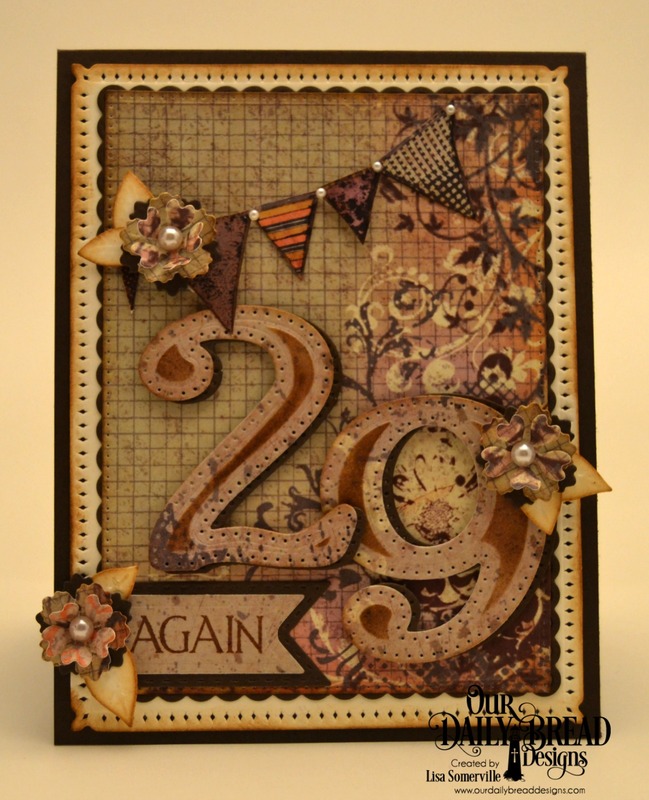 On my next card, I added some stenciling to the Large Numbers, creating a vintage birthday card using the Vagabond Treasures paper collection. Three randomly selected winners will each receive a $25 gift code to the ODBD Website just for commenting on the Design Team cards! You have until March 18, 2017 at 9:00 p.m. EDT to leave your comments. The Winners will be posted March 19th, on Our Daily Bread Designs Blog, so be sure to check back there to see if you won! Celebration time! Really love those large number dies! Great cards! I love the big numbers to personalize the cards! I am really liking those big number dies -- putting it on my list right now! Your cards are both lovely. Your first card really "sticks out" for me. I like it a lot. Love the big numbers. Keep up the good work! I love the vintage feel of your special cards with the number dies.Happy anniversary ODBD and thatks for great inspiration from your team. Love the vintage feel of these cards. Such wonderful cards! I love the clean look on the first and the vintage look on the second! Love the colors on your cards! Both designs are very pretty. Fabulous cards, I love the colors and the vintage look of them. Very nice cards! 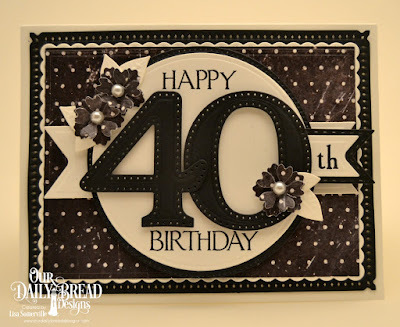 Great layers and I like your pennants with the different papers, great vintage look card! You and Julie create lovely vintage cards. Wonderful cards for these special occasions. Both your cards are eye catching. The numbers on the black and white one really pop. The vintage card has a sweet warm feel. I love the banner too. I really liked the colors and the style of your cards. I think that I will use the same colors to make cards for my husband on his Birthday or Anniversary. Keep up the good work! Wonderful samples, Lisa! Love the 40th card! Both of your creations are beautiful, Lisa!! So many gorgeous use of dies and patterns!! "29 again"...such fun for a birthday card for that special friend with whom you can laugh and be honest! Thanks for the vintage idea, Lisa.